A well furnished house is the desire of every homey person. Especially the wood furniture is always the first and favorite choice of the people. But the market prices of wood furniture would drop your jaws with amazement. A simple solution for this tangling problem is the use of pallets, often free available and easy to work with material. 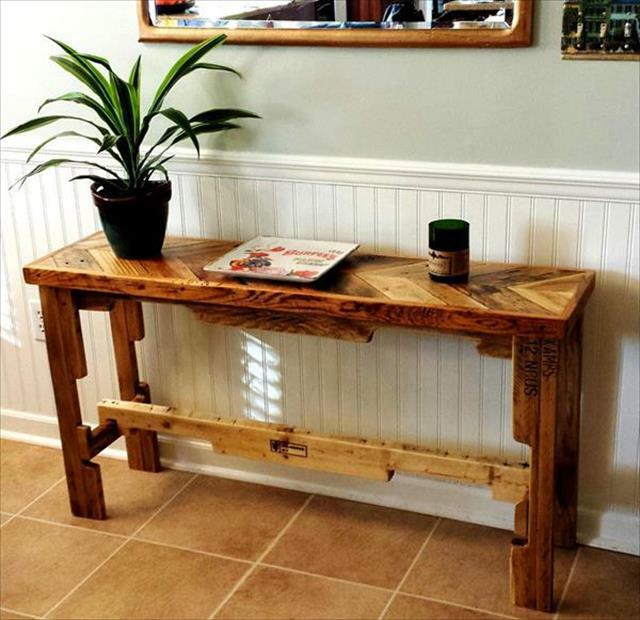 With pallets wood you don’t have to cut the corners to bring some dreamy pieces of furnished you have always wished for. With this wonder pallet wood you can color your imagination, building all the pallet furniture or anything for any part of the house. With our collection of 10 DIY pallet furniture ideas it would be easier for you to chose the right item. You can dissemble the pallets into pallet planks for easy and feasible handling of every project. Starting from your garden, you can build a simply designed bench to spend some alone time with your partner in the fresh ambiance. Complimenting your contemporary decor, you can make a scrap hack dining table for the dining area allowing maximum people to dine together. Oh how can we forget a coffee table, the integral part of every home and especially living room furnishing, can be formed in your desired size with pallets. Folding garden table, a sleek designed side table, outdoor table are some more favorable suggestions to offer you. A couch set for outdoor including coffee table and lounge furniture are the most alluring items to make you enchanted with pallets. Headboards are very in, and are the best option to customize pallets. Don’t let your pets fell left over, built a cozy and their personalized bed from pallets to make them happy.